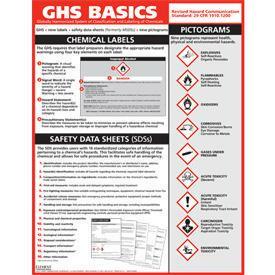 This poster helps employees learn the basics of GHS. Poster Reads "GHS BASICS GLOBALLY HARMONIZED SYSTEM"
It has all the key elements of GHS training that all employees are required to take. The vinyl poster features the 16 sections of the Safety Data Sheets, the updated label format, and the new label pictograms. It reads "GHS BASICS GLOBALLY HARMONIZED SYSTEM".